Sadly the sun has definitely set on my Greek island holiday where, as you know, I have been doing a 5-week yoga retreat with my teachers, Graeme and Leonie Northfield. From past experience, I have found Graeme and Leonie's workshops to be deeply profound on many levels, and this year was no exception. For me this was a much needed time of letting go, after all the stresses of the Christchurch earthquakes and their aftermath, and I am enormously grateful to Graeme and Leonie for having allowed the space and the support for me to find a way in my practice to both honour and overcome what I have been through. I have come home with the inspiration to take a more joyful and compassionate approach to my practice, letting go of much of the judgement that has always "dogged" my practice up until now; a new-found gratitude for what I can do, rather than harsh judgement of what I can't. It was wonderful to come together again with special friends made at previous workshops, and to make some new friends too. The bond which seems to develop between people practising together in this intense way is unlike any other. Off the mat also, the retreat did not disappoint. We enjoyed glorious, sun-filled days (not a single drop of rain in six weeks), mornings at the beach after practice, leisurely breakfasts, mid-day trips to town for coffee and a bit of shopping (which may or may not have included pastries), afternoon siestas, and long dinners at the local tavernas. We even managed to take in a cooking class, which was one of the real highlights of the trip for me, and which I will tell you more about in another post. And now I have returned to wet and wild here on the Auckland west coast. Day after day the coast has been lashed by fierce winds, bringing with it huge surf. Even in normal conditions the sea here can be treacherous, but right now we are witnessing mother nature at full force. Then at night come the electrical storms. It is of course all very spectacular, and although it has its own dramatic beauty which I love, there is no doubt that being thrust into the midst of wintery storms after weeks of endless 30 degree C days is a bit of a shock to the system. Crisp, fresh salads and summer fruit have had to move over in favour of more warming food such as soups and pasta dishes, and yet I still want to cling to some of that lightness of summer foods - my body is not quite ready to plunge into heavy stews and casseroles just yet. In a recent issue of Jamie Magazine , The Italian Issue I came across this recipe for Pasta e Ceci, which seemed to fit the bill perfectly. The pasta and chickpeas provide just enough substance to provide comfort and warmth; spinach, herbs and lemon add lightness and brightness to the dish; and the accompanying mixture of creme fraiche, garlic and paprika adds some extra warmth and creaminess without a trace of heaviness. Actually in the original recipe Jamie uses a mixture of yoghurt and harissa, but since I didn't happen to have either of those on hand I used a little creative license. 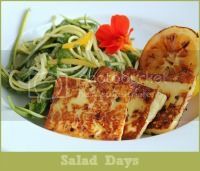 I'm sharing this recipe with my friends at I Heart Cooking Clubs, where we continue to cook with Jamie Oliver. This weeks theme is Pot Luck, and I think such a dish would be a great contribution to a pot luck dinner anytime of year. Bring a large pan of water to the boil over high heat, salt the water liberally, then add the pasta to the water and cook until almost al dente. Meanwhile, put the chickpeas into a bowl. Add the chopped mint, salt, pepper, olive oil, grated zest and juice of the lemon. Toss well to combine. Add the spinach to the bowl of chickpeas and toss together. When the pasta is almost, but not quite al dente, remove it from the heat, and reserve about one cup of the pasta water. 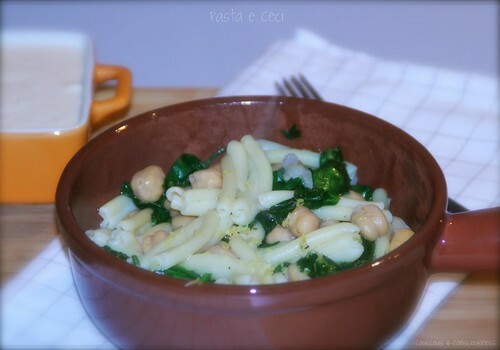 Drain the pasta and then return it to the pan, adding in the mixture of spinach and chickpeas. Place the pan over medium heat, add the reserved cooking water, and cook until the pasta is fully cooked through and the spinach has wilted. Remove from the heat, add a little more olive oil, and taste, adding more lemon juice, salt or pepper as necessary. In a separate bowl mix together the creme fraiche, garlic and paprika and serve alongside the pasta. I really enjoyed this dish, in fact I ate it three nights in a row - it is certainly not a heavy dish, so could easily be enjoyed anytime of year, and if you're after quick and easy it doesn't get much better than this. .... or check out Jamie's Italy and many of his other great titles, available from Amazon or Fishpond NZ. I am also sharing this post at Magazine Mondays (hosted by Cream Puffs in Venice) and at Presto Pasta Nights (which will this week be hosted by Tandy of Lavender and Lime). So good to visit with you again! Your retreat sounded wonderful and I am sure soothed so many areas of your life that had become torn and worn from the quake. Thanks for sharing all this and the pasta too. What a change for you to come back...I don't mean just the temperatures and weather but the state of mind. Welcome back, my friend. Your dish looks good, I have been a slacker with Jamie recipes as of late. Welcome back, Sue! I'm so glad to know that the 5 week retreat has been good and inspiring! 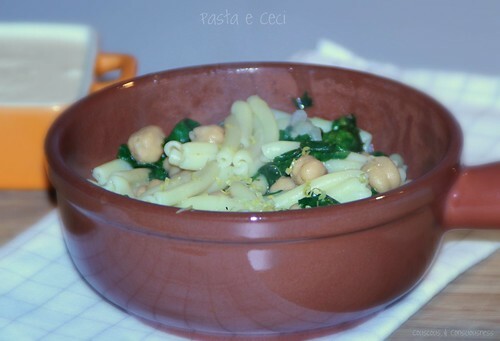 The pasta looks fabulous, love it that it has chickpeas! I would enjoy this too! Have a lovely day! Thanks for sharing the beautiful photos. The cooking class sounds like fun. Great JO dish. Light, fresh, yet satisfying. Welcome back, Sue. I hope you bottled up some of that Greek sunshine! Welcome back! Great dish! One of my favs! Lovely pics, hopefully Muriwai weather will be kind this weekend. 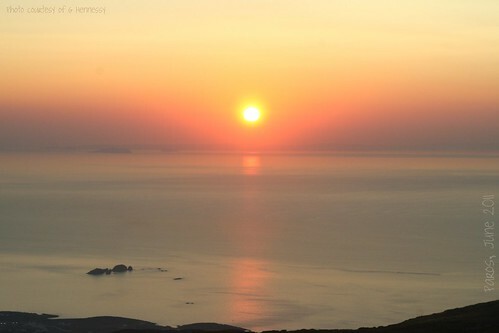 Wow Greece, how wonderful! Are you in Muriwai? If you ever come up West Coast Rd pop by to see me :-). I love pasta e ceci, although I never seen it with creme fraiche on the side, I am curious now! Thanks Tandy, it's nice to be joining in with PPN once again. Hi Tina - yes, coming back from a retreat can be a shock to the system, most especially emotionally - it takes time to ease back into day-to-day life again. Hope you join in with Jamie again sometime - I do enjoy his food. Hi MM - thanks for visiting. Those photos from Greece are lovely aren't they - my partner, Graham, took them and I'm grateful to him for letting me share them. Hi Clare - thanks. Am trying to cling to some of that Greek sunshine, and the last vestiges of my tan which is fading altogether too quickly. Hi milliemirepoix - yes these ingredients would be great in a hearty broth. Actually one night I made it I added quite a lot of extra pasta water when I returned the pasta to the pan with the spinach, etc in order to make it more soupy - ended up with just a very light broth, perfumed with the lemon - it was a nice alternative. Hi Deb - after my own heart - I love just about anything with chickpeas in it too! Your trip sounded amazing! How crazy has the weather in NZ been aye?! Far out. I thought the weather over here in Perth was not really much better than home this winter, but in the last few weeks NZ has been hammered and we've had sun! Hope things settle down for you all soon. I so wish I had "known" all you fellow kiwi bloggers when I was still in NZ. We will have to all catch up when I'm home next. I'd so love to make it home in November for the NZ food bloggers conference, but we'll just have to see how things go. Perth's so far away! Sue - I love all the pictures you've shared while you've been in Greece. I'm so glad to hear your time there was so beneficial and helpful. This pasta dish is a dish after my own heart as I'm a huge chickpea lover as well. I'm going to make a note to try it during our last few weeks with Jamie. Sounds like an amazing time in Greece! 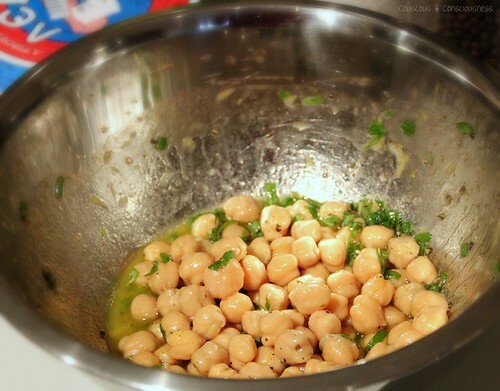 Count me in for anything with chickpeas, it looks delicious! Beautiful photos, sounds like a lovely retreat. I think I'm more of a wet and wild gal myself. I would love to see your country one day. For some reason loud weather calms me down. Like, whatever I have going on inside, nature can take it. Hi Carol - thanks for visiting and taking the time to comment - it's really appreciated. Thanks Natshya - the retreat was fantastic. I hope you make it to New Zealand one day - our west coast is definitely the place for wet and wild - it really can be spectacular. And, of course, if you ever do come by this way, you will be sure to let me know won't you?! Thanks so much, Elizabeth, and thank you for visiting and taking the time to comment - it really is appreciated. Yes, the mint is a great addition in this dish. What a beautiful, beautiful post! And a beautiful pasta dish to top it all off!